Discover Defects Before You Close on Your New Home! Will you catch all of the flaws in your new home during the walk through inspection? Your builder can leave you with all sorts of nightmares if you don't do a thorough inspection. "I GOT what I PAID for. I GOT what I PAID for....."
And a year from now, when three or four defects surface, AFTER your warranty expires, repeat those same words. Do you want a powerful tool that will allow you to uncover flaws and mistakes today and act as an important benchmark one year from now just before the warranty on your house expires? If so, you need my Walk Through Inspection Checklist. The best part is that it can be yours just minutes from now. 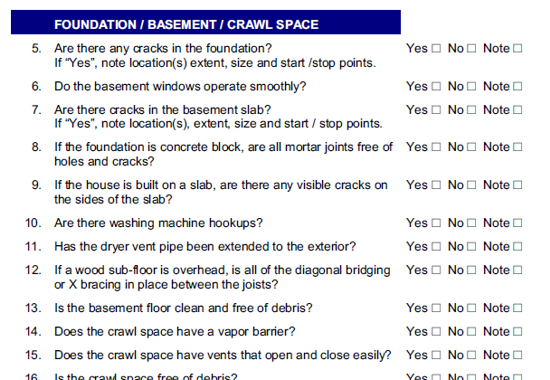 Below is a screenshot of some of the questions from the Foundation Section of this Checklist. The Checklist is available to you as an immediate download (PDF file format) once your order is processed. After completion, you will be taken to a page with a download link for the Checklist file. In addition, you will receive a confirming email. In the Cart Items section of the email, there will be a download link. Just click on the link and the Checklist will be downloaded to your computer. The downloaded file can be read using the free Adobe Reader software. We are so confident that you will enjoy and benefit from this Checklist that we guarantee your satisfaction, with our no-hassle, no questions asked return policy. "Thank you very much for the Walk Through Inspection List. It was invaluable. Using the list, I found 40 items that need to be repaired/completed before I make my final payment to the builder. The checklist is well worth the money. Thanks again!" "I purchased and utilized your checklist for the walk-through inspection of our new house. The number of items in the checklist was incredible. It saved both myself and the builder a lot of time." Holley S., Nashville, TN, sent this email .. I used your (Walk Thru) checklist for the condo I plan to buy and really surprised all involved. They had only allocated 30 minutes for my walk through since it's just a condo, but I kept them there longer and feel much better. There were only a few things that need attention but I would have never noticed them if it weren't for your packet. So, thank you. Click the button below to add the Walk Through Checklist to your wish list.